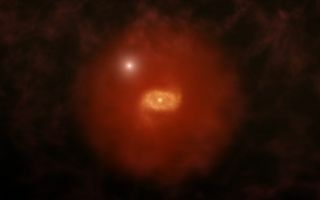 Artist's impression of a "baby" Milky Way-like galaxy in the early universe with a bright quasar shining through the galaxy's surrounding halo of hydrogen gas. Those halos move far beyond the galaxy's star-forming disks, new research suggested. A background quasar 12.5 billion light-years away from Earth shines near a young Milky Way-like galaxy 12 billion light-years away in this image that combines infrared observations from ALMA and optical observations from the Keck Observatory. ALMA spotted the galaxy's ionized carbon (green) and dusty star-forming disk (blue), and the color of the quasar indicates it's shining through a massive halo of gas — extending much further from the galaxy than the galaxies' star-forming dust. You can follow us on Twitter at @Spacedotcom. We're also on Facebook & Google+. Original story on Space.com.